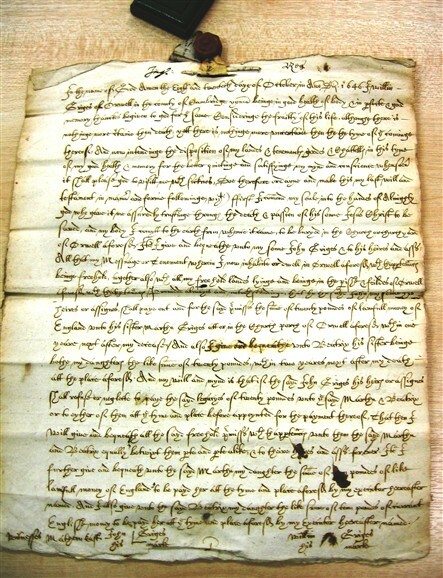 "Considering the frailty of this life, although there is nothing more certain than death, yet there is nothing more uncertain than the tyme of the cominge thereof"
Although this sheet is signed and witnessed at the bottom, there is in fact a second page of the Will which has not been copied. The contents of the second page are shown in the Transcript. Note the quaint sentiments expressed in the first few lines of the Will. Note also that the legacies have to be paid by the Executor 'in the Church Porch' - a means of making sure that the payments are open and honest and can be witnessed by all. It is possible that the dwellinghouse where William lived in 1646 is now no. 55 High Street, as a John Griggs is shown as living there in the 1686 map. It is not the only house owned by the Griggs family however, and they must have been comfortably off to judge by the legacies of £20 each to the girls of the family. If John did not pay these legacies, then he was to lose all his benefits under the Will. The Testator describes himself as "yeoman" which denotes someone a bit higher up the social scale than cottager or farmer. Note the provision that the Wife was to have a choice of two pieces of land each year to be cropped with wheat and barley. Would this have been sufficient to keep her? It was quite a common way of providing for the wife in Orwell at this time. There is an entry in the Parish Registers recording the death of William Griggs the elder in 1649. These being witnesses Mathew East and John Griges his mark. This page was added by David Miller on 26/01/2013.